Chuseok is one of Korea’s three major holidays, along with Seollal (Lunar New Year’s Day) and Dano (the 5th day of the 5th lunar month). Chuseok is also referred to as hangawi. Han means “big” and gawi means “the ides of the 8th lunar month or autumn.” According to the lunar calendar, the harvest moon, the largest full moon of the year, appears on the 15th day of the eighth month. In the morning of the day of Chuseok, family members gather at their homes to hold memorial services called charye in honor of their ancestors. Formal charye services are held twice a year: during Seollal (Lunar New Year’s Day) and Chuseok. 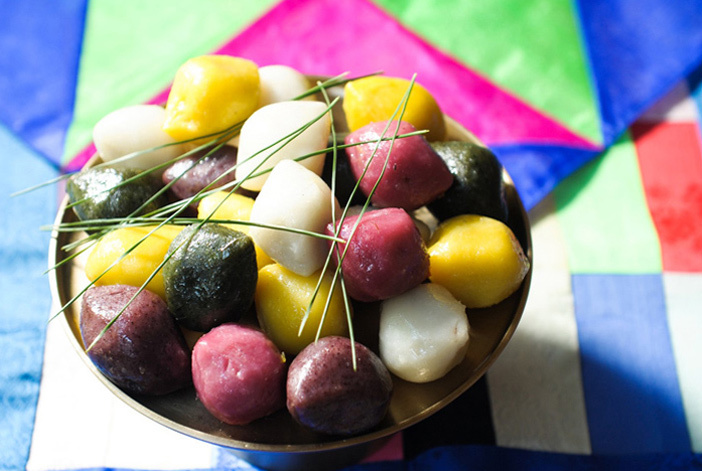 During Chuseok’s charye, freshly harvested rice, alcohol and songpyeon (half-moon rice cakes) are prepared as an offering to the family’s ancestors. After the service, family members sit down together at the table to enjoy delicious food. 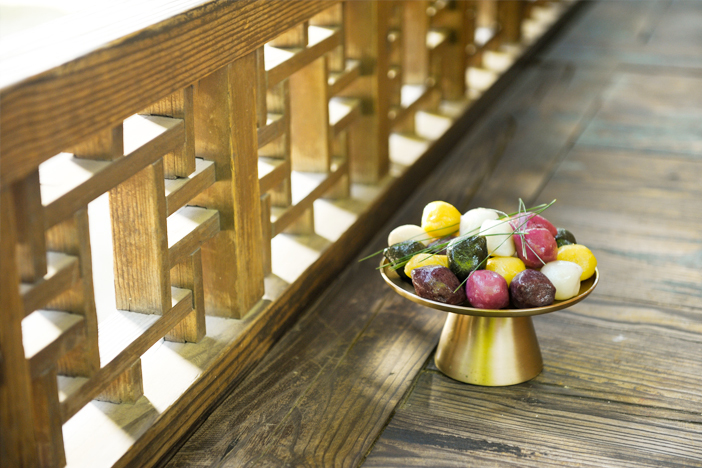 Another traditional custom of Chuseok is seongmyo, or visit to the ancestral graves. Seongmyo is an old tradition that is still carried out to show respect and appreciation for family ancestors. During seongmyo, family members remove the weeds that have grown around the graves and pay respect to the deceased with a simple memorial service. 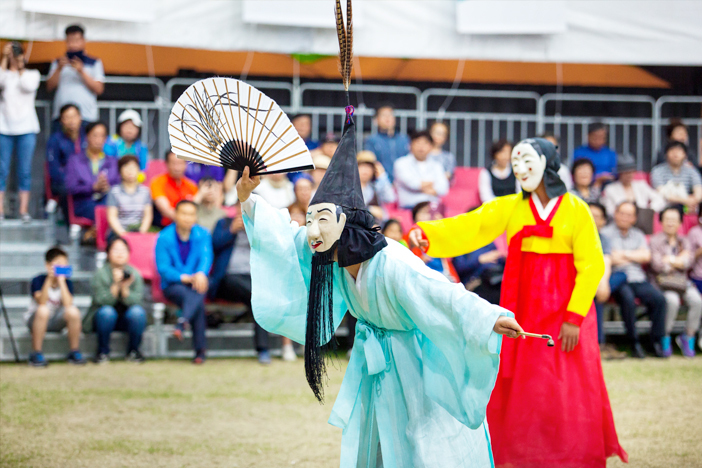 As Chuseok is a celebration of harvest and abundance, the holiday period is made joyful with various entertainment and folk games such as samulnori (traditional percussion quartette), talchum (mask dance), ganggangsullae (Korean circle dance), and ssireum (traditional Korean wrestling). Ganggangsullae is performed during Jeongwol Daeboreum (celebration of 15th day of the first lunar calendar) and Chuseok. In this dance, women dressed in hanbok (traditional Korean clothing) join hands in a large circle and sing together on the night of the first full moon and on Chuseok. There are several stories about its origin. One of the most well-known stories says that the dance dates back to the Joseon Dynasty (1392-1910) when the Korean army used to dress the young women of the village in military uniforms and had them circle the mountains to give off the appearance that the Korean military was greater in number than it actually was from the enemy side. The Korean army enjoyed many victories thanks to this scare tactic. Ssireum, another significant traditional entertainment, is a one-on-one wrestling match held on a circular sand pit that requires strength and skills. 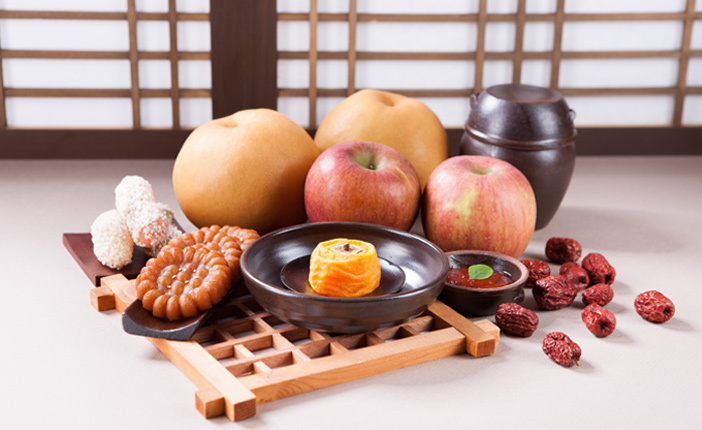 A variety of foods are prepared during Chuseok to celebrate the bountiful harvest of the year, and one of the most significant foods that represent Chuseok is songpyeon. Songpyeon is prepared with rice powder that is kneaded into a size that is a little smaller than a golf ball, and then filled with sesame seeds, beans, red beans, chestnuts, or other nutritious ingredients. When steaming the songpyeon, the rice cakes are layered with pine needles to add the delightful fragrance of pine. It is an old tradition for the entire family to make songpyeon together on the eve of Chuseok. An old Korean anecdote says that the person who makes beautifully shaped songpyeon will meet a good spouse or give birth to a beautiful baby. Other significant Chuseok foods include traditional liquor and jeon (Korean pancakes). Jeon are made by slicing fish, meat and vegetables and then lightly frying them in a batter of flour and eggs. They make a perfect pair with traditional Korean liquor.